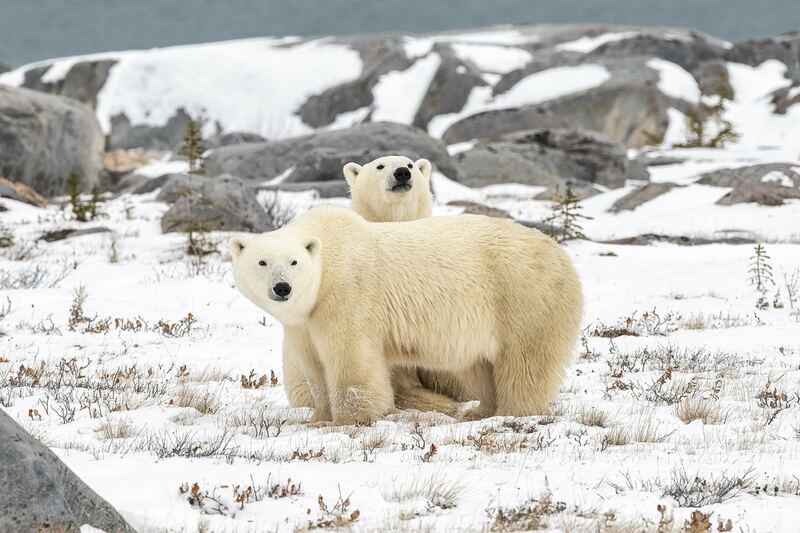 Rendezvous with the Ice Bear - Photographing Polar Bears in Churchill. 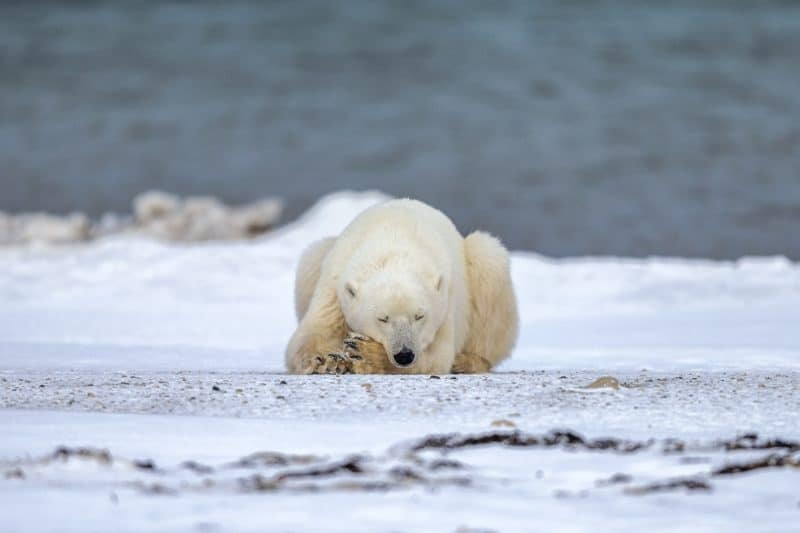 A male Polar Bear (Ursus maritimus) walks up the shore of Hudson Bay in Polar Bear Alley, waiting for the water to freeze. It will be a few more weeks before he’ll be able to step on the sea ice to hunt ringed and bearded seals. This photo is clearly one of my favorites from my trip (if not from this year) because of its poignant tone and the visual play between the bear, the ice, and the waves. I also intended to frame the photo so that the bear looks small compared to his environment (even if in reality he is a huge specimen), to poetically emphasize his plight in a changing world. It all started while I was on assignment aboard Greenpeace’s Rainbow Warrior last February. The ship was on a climate justice tour, rallying and empowering communities to shift to renewable energy, and as expected, climate change was the prevailing theme. 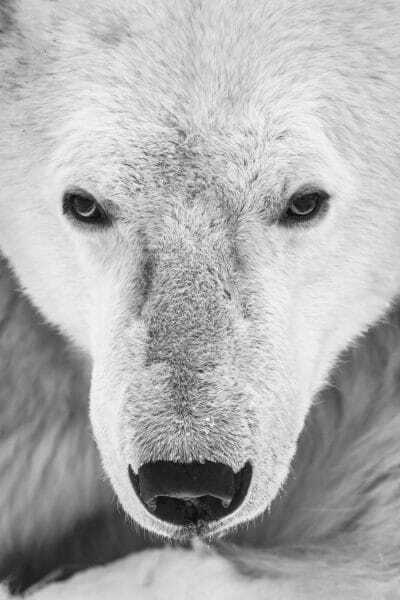 I was deep in conversation with their regional head, and the topic shifted to Polar Bears, the symbol for the climate struggle. I was already aware of their plight, but not to the level that we delved into during the trip. I made it my mission to photograph them as soon as I can. The opportunity came relatively quickly. My wife and I were planning on visiting family in Canada in October and we made the no-brainer decision of doing a side trip to Churchill, Manitoba, since this would be peak Polar bear season. Things came together very smoothly and in such an organic fashion that we felt like were predestined to go. (L-R) My wife Pam, our rockstar guide Remi Allen of North Star Tours, and myself. I absolutely loved the fact that we were riding around town and the tundra in a sweet Escalade. My friend once told me back in college that the backbone of any successful enterprise is research. It has stuck to me then and I still believe in it now—more than 20 years later. For a conservation photographer like me whose focus was mainly underwater life and coastal communities in the South Pacific, heading to the Canadian Subarctic was an intimidating enterprise. I had three major concerns: the cold, the gear, and the subjects. Since Churchill was not yet too far north, transportation and logistical issues weren’t concerns this time around. My research began with watching Youtube videos of Morten Hilmer. I wanted to get a feel of how it is to work in the cold and how we operates in those conditions. His videos also gave me the idea of trying to get some vlog content on my trip. 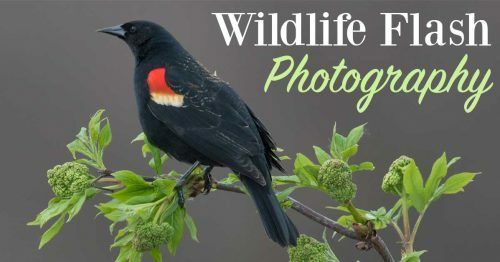 Next I read articles on equipment and also, on cold-proofing your photography gear. This is where I stumbled upon Shutter Muse, and it helped a lot (more on this later). 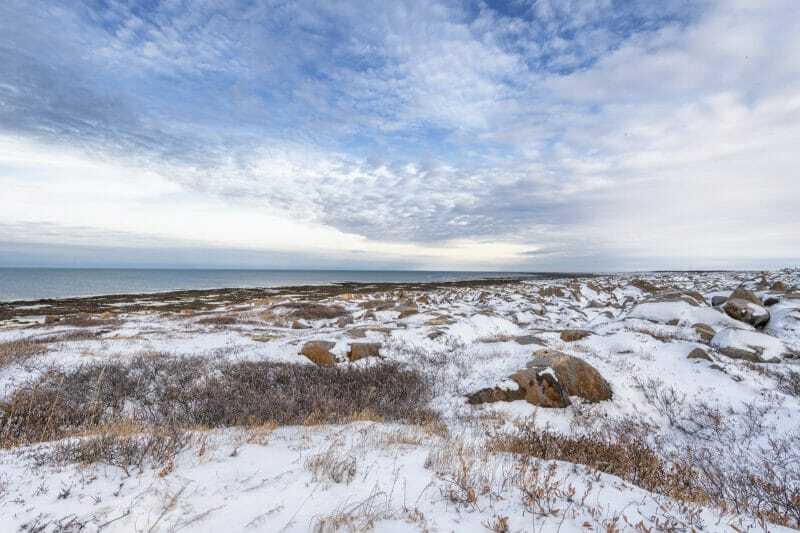 The largest bay in the world sits in the migratory path of Polar Bears. Because of three rivers that pump in fresh water, the bay freezes faster than the rest of the area. This allows bears to hunt sooner, which in turn is the reason why there are so many bears in Churchill. Lastly, as with any project, I researched my subjects and searched for all available photos of them that I like. I download these to my iPad and then went through them over and over during the course of my trip—on the plane, in a coffee shop, even on the nights before a tour. This exercise teaches your brain to see. 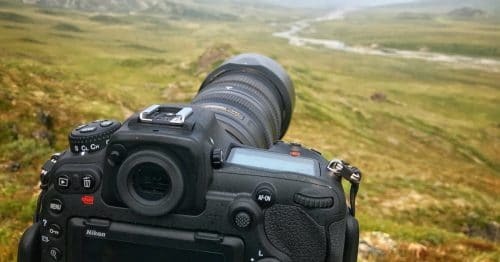 It expands visual and photographic opportunities in your head so that when a similar situation appears in front of your lens, your brain will recognize it as a potential shot. That’s when creativity kicks in and you capture your own take on the scene and situation. I also looked at the work of specific photographers. Paul Nicklen is probably my favourite conservation photographer (I have his ebook, “Photographing Wild” and I read it almost every month) and I also love the style of Vincent Munier’s shots of arctic wildlife . The author shooting with a Nikon D850 and Nikkor 400mm f2.8 VR FL lens on the frozen tundra in the Canadian Subarctic. Having been a commercial director for many years, I lived the idea of “beg, steal (not really), or borrow” when it comes to equipment in order to fit the budget. Naturally, I applied the idea to this trip. Since I work mainly in the SEA region, I didn’t have much in terms of cold weather gear, never mind deep winter clothing. I wrote to Columbia Sportswear Philippines and asked for support and they helped me get sorted out. Next on the list was a second camera and a long lens. 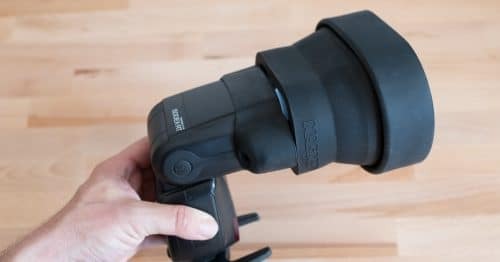 I didn’t have a super telephoto lens, not just because I didn’t need it for my regular underwater work, but also because they are expensive! I wrote to Nikon Philippines asking if I could borrow another D850 and maybe a 70-200 with 1.4x TC. While they’re at it, why not a 400mm 2.8? Surprisingly, with the help of Nikon Singapore, they were able to loan me another D850 and a Nikkor 400mm 2.8 VR FL! Shutter Muse gave me the idea to purchase Valleret Ispoot gloves and Storm Jacket camera covers for the trip, but sadly, both didn’t arrive on time. I also brought a dry bag and ziplocks to combat condensation as per Dan’s (Carr) recommendation in his guide to photographing in winter conditions. After a few days in Banff, Alberta, taking landscape shots and in Winnipeg shooting Bison in Fort Whyte (which I saw as practicing for the bears), we flew up to Churchill, Manitoba (Wiki). We only had two and a half days to shoot (half of what is recommended) so we hit the ground running with our guide Remi Allen of North Star Tours. I forgot to mention, my wife has eyes like a hawk. She usually spots for me underwater and rarely misses an animal. 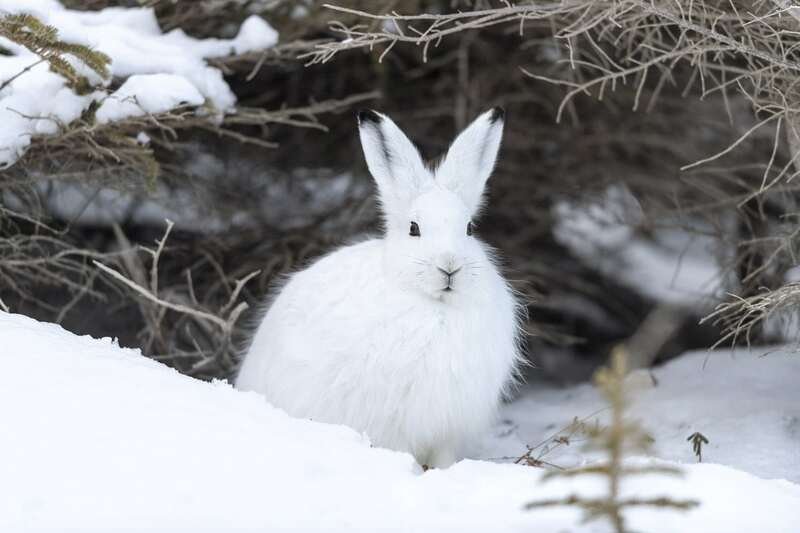 It was no surprise then, that she spotted an Arctic hare hiding in a shrub as the SUV was moving along. It was so impressive! I was able to get on my belly and crawl to within 10 feet of the hare for a great portrait. I learned how to be patient and to make a slow approach when I was shooting skittish sharks and rays. Our first encounter with a polar bear was not I imagined it to be. I thought the world would slow down and our jaws would drop—but no. The SUV suddenly halted as if to let a pedestrian pass, only this pedestrian was a polar bear waiting by the road beside a rock. It then proceeded to cross the road to defecate by the shore—it was hilarious, comical, and unlike anything I’ve ever seen. Nanuk (polar bear in Inuktitut) is regarded as the master of all bears in Inuit legend. They themselves decide if hunters are deserving of hunting down their kind. I was watching this lazy bear in the Eskimo Dog Sanctuary in Churchill, MB when it slowly looked up and turned his eyes towards me. I felt his stare pierce through my soul. The highlight of this day was actually a bittersweet one. We were following a determined bear that was heading into town. We later figured out that it was attracted to the seal meat inside a bear trap, an oversized tin can with bait that, when pulled, would cause the rear door to come crashing down. 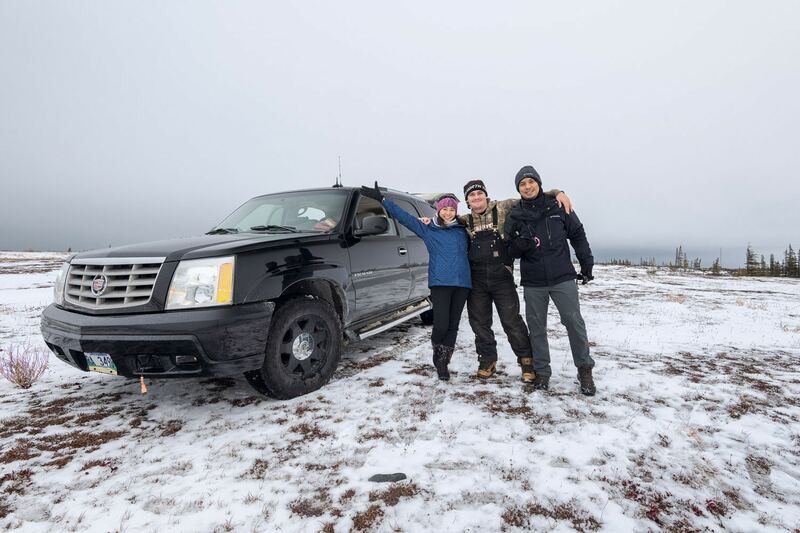 We tried our best to drive and scare the bear off but in the end it was trapped and brought to polar bear jail, where it would spend roughly 30 days of no food (only water) before being darted and flown via chopper 60km to the north, usually never seen again. I caught the whole affair in 4K using my D850 and the 400mm lens—an event rarely caught on camera. As with any photo trip, I review my photos at the end of the day to check if there are any adjustments that I have to make. It’s a good thing I did because I noticed that most of my shots had the bears’ eyes out of focus. I was so intent on shooting at f/2.8 to get a shallow depth-of- field that if you missed the focal distance by a short margin (which is normal), the eyes will be soft. I then switched to a range of f/5.6-f/8 and it worked brilliantly for the rest of the trip. This Canadian Eskimo Husky is the rarest dog in North America, and was used for generations by the Inuit and other native communities for transportation (they can transport huge loads for long distances). The day started again with an amazing encounter with a red fox, thanks once again to my wife and her amazing vision. Unfortunately I was too slow with my setup to take a photo, but she was quick enough with her iPhone to get a proof of life! That day we also visited the Canadian Eskimo Dog Sanctuary and I have to say that it was a very interesting experience. I never would have thought that I’d see 36 dogs and three large polar bears peacefully cohabiting in one area. At first we were wondering whether they were mom and cub or siblings, but their dynamics and body language convinced us that it was the former. Here the cub is curiously peeking at a group of vehicles who stopped to see them as the mom watched cautiously. It was on our way home that we got our best surprise yet. I was fast asleep in the car—tired from all the shooting—when Remi shook me awake, and then pointed to my right, saying “look there’s your mom and cub!”. It was our wish to see a mom and cub on this trip and we were so happy that we got to photograph and film a pair. For our last day we only had 4 hours with Remi so I wanted to focus on video. One of my planned shots was of a timelapse of a Polar Bear walking across the horizon. We saw a bear half a kilometer away so we setup a shot along his path in the hopes that he would pass by. Surprisingly he did, but he kept going up and down the ridge, rendering the shot useless. This large male was hunting high and low for berries and seaweed across the Tundra. Polar Bears find what they can to sustain themselves until the sea ice forms. Thing is, I think he smelled the GoPro and decided to go for it! What came next was five minutes of the bear munching on my GorillaPod and licking the GoPro. The GoPro wasn’t linked to my phone so I had no idea what I was getting. I was also worried that he would carry it away or ingest it, but since it’s illegal to interfere with wildlife, we just had to sit and wait it out! Thankfully he lost interest and moved on and I came home with some awesome footage! 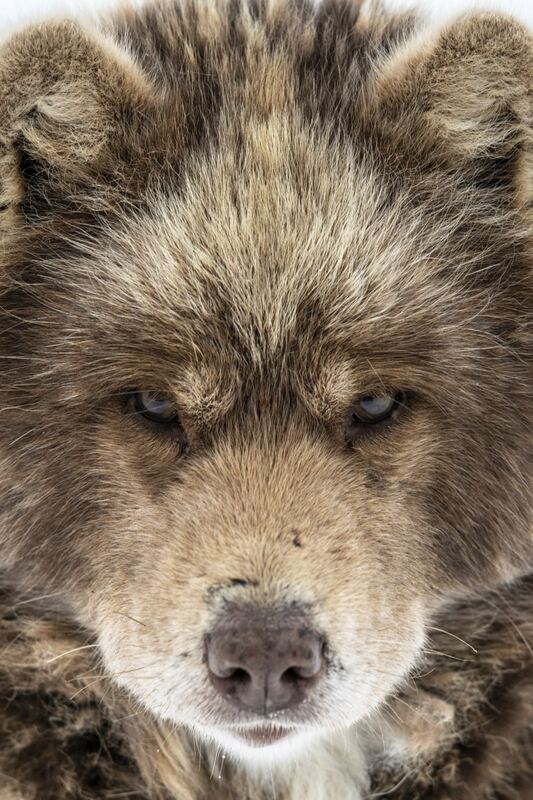 This bear just straight-up got down on his paws and slept. I’d have to say that our Churchill trip was an overwhelming success. In just two and a half days we had 20 bear encounters, footage of a bear getting caught in a bear trap, a mom and cub, and great GoPro footage. We didn’t get an arctic wolf or fox but that was OK—we can always come back. I also didn’t complete my shot list for the video, but then again I made the critical decision at the start to shoot photos first, and film second. The 400mm turned out to be the perfect lens for this trip. Not too long, not too short and having one fixed focal length allowed me to concentrate on the shots and not on changing lenses or focal length. My habit of having two cameras, one with a wide lens and one with a telephoto, worked well here, and while I thought I would miss a 70-200mm that didn’t turn out to be the case. In terms of vlogging, I wasn’t able to comfortably use the 24mm Ai-S lens and the D850. That setup was just too heavy and unwieldy. In the end I realized that the GoPro was just perfect for the job and used that instead. The F1 audio recorder stayed in the bag as well; at the rate we were going, having to operate two devices (GoPro and audio recorder) was just too complicated. Lots of lessons learnt! I’ve fallen in love with Churchill and its bears in the same way I was first captivated by sharks. Shooting in the Arctic was a phenomenal experience and I hope that I’ll have many more chances to do so again. Noel Guevara is a conservation and wildlife photographer, filmmaker, and adventurer based in Manila, Philippines. Currently, Noel has diverted much of his efforts to marine conservation where he covers the Asia-Pacific region, collaborating with the world's top conservation groups and NGOs such as Greenpeace International, WWF, and The Coral Triangle Initiative while providing visual content and articles for magazines and publications. A perfectly timed review for me thanks for sharing! I’m heading there this upcoming October 2019 and have been a bit apprehensive at dealing with the cold so your ideas and comments much appreciated! Come back and let us know how your trip went!